Stereo and Surround Speaker Placement : Audio Design Labs Inc.
As described above, the recommended listening angle for proper stereo imaging with music is 60 degrees between the left and right speakers and this doesn’t change when expanding to 5.1 channels of audio. The center channel speaker should be located on axis with the reference listening position, and both the left and right surround channel speakers should be at an angle of 110 degrees from the centerline (click to view). 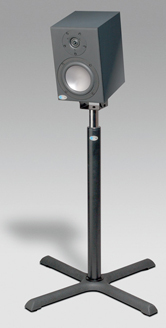 In most applications, surrounds used for music are placed at the same height as the front speakers for a direct sound field (click to view). If this is not possible, tilting the cabinet at the listening area can improve high-frequency coverage. Although the recommendation for music applications should work equally well for film, there may be situations where a more “film” optimized setup is desirable. To correctly relate audio to picture, the recommended angle between left and right speakers is 45 degrees. This narrower listening angle should still yield a very satisfactory stereo image. As with the “music” setup, the center channel speaker, should still be located on axis with the reference monitoring position. Unlike music surrounds, which tend to be direct in nature, film surrounds are usually positioned for a more diffused sound field to simulate the effect of an array of surround speakers used in a theater. For a single pair of surrounds, this can be accomplished by placing them two feet above seated ear height, to the side and slightly by behind the main listening position. For more information on this subject, along with 6.1 and 7.1 surround system configurations, please visit Dolby Laboratories’ website. For information about subwoofer placement, please follow this link.